85mm x 55mm single or double sided business cards printed in full colour on 400gsm silk art board. 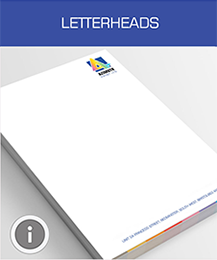 A4 letterheads (headed paper) printed in full colour on one side. DL sized (99mm x 210mm) compliment slips printed in full colour on one side. C4, C5 or DL envelopes printed one side in full colour on 100gsm envelopes. Our stationery is printed in full colour on eco-friendly paper from sustainable sources. Our prices include FREE delivery within 5/10 working days(dependant on product) to one UK address excluding Highland and Islands and there is no charge for debit or credit cards. For deliveries to Highland and Islands please call for a price that includes delivery to these locations. If you need your stationery printing sooner, contact us to discuss a quicker delivery time. What can printed stationery do for me? Printed stationery is a must for any business looking to create a professional image for their customers. The right letterheads, envelopes, compliment slips and business cards will prompt a great first impression and support corporate branding strategies. Whatever sector you operate in, it is likely you will need to make particular efforts to stand out from the crowd. Whether you are a small business, a large school or a popular club or society, printed stationery can help in establishing your brand and creating that vital good first impression when networking with new contacts and customers. Professional stationery is ideal for drawing a line between personal and corporate communications and making it immediately known to your contacts exactly who they are dealing with the moment they open your letter or look at your business card. 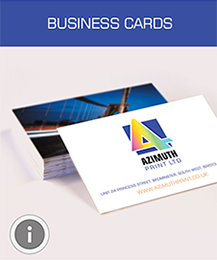 Azimuth Print, the UK's premier stationery printer offers a cheap, high-quality stationery printing service including letterhead printing, envelope printing, compliment slip printing and business card printing. Our full-colour, A4 (297 x 210mm) letterheads can be printed on two types of paper- either 100gsm Multicopy Original or 100gsm 4CC paper. Delivery within 5 working days for this type of printed stationery is free to the mainland UK excluding Highland and Islands. 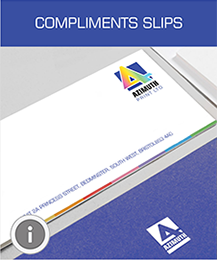 We offer compliment slips in DL (210 x 99 mm) size - perfect for additional notes and thanks when sending a product to a customer or responding to a request by post. Delivery within 5 working days for this type of printed stationery is free to the mainland UK excluding Highland and Islands. 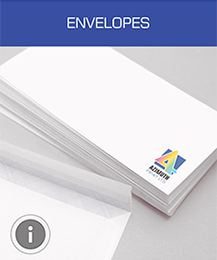 When it comes to printed envelopes, we can produce DL, C5 and C4 sizes. DL is ideal for A4 paper folded twice, while C5 fits A4 paper folded once and C4 can hold A4 paper without folding it. Delivery within 10 working days for this type of printed stationery is free to the mainland UK excluding Highland and Islands. In terms of business cards, we offer both one-sided and two-sided products. Our full colour 85 mm x 55 mm business cards can be ordered in quantities of between 125 and 5,000 and are printed on 400gsm silk art board. Delivery within 10 working days for this type of printed stationery is free to the mainland UK excluding Highland and Islands. We provide a free online stationery design service. If you do not have print ready artwork and you would like to create your own stationery design, try our Online Design Studio. You can create your artwork from scratch or you can select one of more than a thousand free stationery templates. Our Online Design Studio is easy to use and it is FREE! You can either send us your own artwork or commission our designers to come up with a great look for your printed stationery for an extra charge. If you need to make small changes to your copy and design, we can take care of these at no extra cost, while larger amendments to your stationery can also be made for a fee. To find out more about the UK's premier stationery printer, just get in touch for a quote or for answers to any questions you might have about our stationery printing services.